A few days before leaving for our trip, A. and I decided to scratch Venice off our long list of cities to visit in order to give ourselves more time in Barcelona, Cannes and our next stop, Florence. 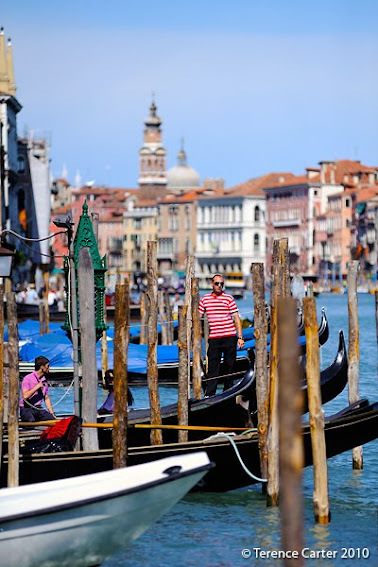 Still, I wanted to share a couple great posts about traveling through Venice. Hopefully one day I'll get to visit her myself. Travel writer Lara Dunston of Grantourismo and her photographer husband Terence Carter have been visiting Venice for over a decade and she says that she was smitten by Venice when she opted against staying in another hotel. “The first time we went it was just for a few days, as part of a longer backpacking trip through Italy, Spain and Portugal. We stayed in a budget hotel with a telephone-box-like shower in the bedroom! On the second visit, we rented an apartment, and I fell head over heels. Last year, I finally realized it was a deep and meaningful love after we spent two weeks in Venice in a vacation rental – a palazzo apartment on the Grand Canal!" The couple has been all over the world as part of a yearlong grand tour they did in partnership with HomeAwayUK where they stayed in a whopping 36 vacation rentals over 12 months including a beach house in Costa Rica to a penthouse in London. But even with all she's seen, Venice still remains Lara's favorite spot. 1. Stay in a local sestieri. Stay away from the touristy areas around St. Marco and the railway station and stay in a local sestieri, or neighborhood, instead, where Venetians live. I really like the backstreets of Castello and Cannaregio where you find fewer tourists and will see little old ladies gossiping on benches in the squares and kids playing beside the tranquil canals. 2. Rent a palazzo. Skip the hotels and hostels and rent something instead. While I understand a whole palazzo is probably out of your price range (it’s certainly out of mine! ), you can find great value apartments in old palaces. The first one we rented years ago was a small studio that cost us just 60 euros a night – a bargain for Venice. On the last trip, we stayed in an atmospheric 17th century Grand Canal palazzo where I could lean out the window each evening and wave at the tourists on the gondolas gliding by! 3. Buy "My Local Guide to Venice." It’s a lovely, compact little guide published by Venetian husband and wife Matteo Bartoli and Mara Sartore, written by locals and available in most bookstores in Venice. It’s crammed with local tips on walks, galleries, museums, churches, shops, cafés, bars and restaurants, many of them off-the-beaten-track or given a fresh local perspective. 4. Stroll everywhere. Most Venetians we meet tell us that they walk everywhere – that’s why they’re so slim! Even locals agree that the vaporetto (public ferry) is expensive. While I’m not recommending you sprint around the city like a Venetian, if you do want to get somewhere fast, just hold on tight to the shirt-tail of a local! If you’ve got time, however, it’s best to take it slowly. Focus on exploring one sestieri at a time. Don’t throw away the map though, because you will get lost. When you do, just look up and you’re sure to see a sign pointing you to Rialto or Accademia (the two bridges) or San Marco or Piazzale Roma (the main squares). 5. Shop Venice’s markets. If you’re able to rent a place, do your shopping at the Rialto markets early each morning, where you can buy wonderful, local seafood, or the Monday organic markets (which start around 11am-noon) at Piazzale Roma, where there’s beautiful fresh fruit and vegetables from the islands in Venice’s lagoon. If you’re not renting a place, the markets are still the place to head to buy delicious fresh fruit to munch on during the day or cheeses, cold cuts and wine for snacks in the evening. There are a few lovely quiet spots on the canal behind the markets where you can dangle your legs over the side and watch the boats go by. 7. Eat like the locals. This means not eating at the tourist restaurants on the main squares or beside the Grand Canal, and slipping into the backstreets, where you probably won’t have a spectacular view, but you will get to eat stunning food. Make your first stop my favorite Venetian restaurant Trattoria Antiche Carampane (Rio Tera de la Carampane, just off Ramo del Tamossi at San Polo). Note the sign out front which says, "No pizza, no lasagne, no menù turistico” – this is exactly what I love about this place. Owner Francesco heads to the Rialto markets with his chefs every morning to buy the freshest local seafood and that’s what you find on the tables here. Call ahead and book a table, and take a map, it’s tricky to find. And that’s exactly how we like it! Ask Francesco or his waiters for more eating tips. 8. Better yet, learn to cook local cuisine. Try to make time for a cooking class with Countess Enrica Rocca to learn how to cook Venetian cuisine. It’s a full day but a fun day. It begins with a chat over coffee at a café with the other students to decide what to cook, followed by a market walk to see what’s fresh and buy the ingredients, a visit to MilleVini (one of Venice’s best wine shops where Lorenzo will brief you on Veneto wine) and then a spritz at the bar across the lane before strolling back to Enrica’s. Held in her light-filled Dorsoduro home, this could just be the best time you’ll have in Venice, if not your whole trip! 9. Kick Back on Campo Santa Margherita. Forget Harry’s Bar and the usual spots mentioned in all the travel guidebooks. My favorite place for a drink in Venice is one of the handful of bars and pubs on Campo Santa Margherita. They’re nothing special, so don’t order a martini, what you’ve come for is the local atmosphere. If you’re tired, head here for a quiet sunset spritz, but if you’re up for a bit of party, head here late when the square gets jam-packed with university students drinking beers. Prices are cheaper than Harry’s Bar and the place has a whole lot more atmosphere as far as I’m concerned. 10. Learn to love the spritz. That’s the tangerine-coloured drink you see Venetians clutching in their hands, from early in the morning (that’ll be council workers or market vendors who’ve been up since 4 a.m.!) until late at night (that’ll be the students on Campo Santa Margherita who don’t drink beer). I like mine in the late afternoon, just as the sun is setting. If you rent an apartment, you can make your own: Aperol or Campari, Prosecco, soda water and a slice of orange. Cin cin!